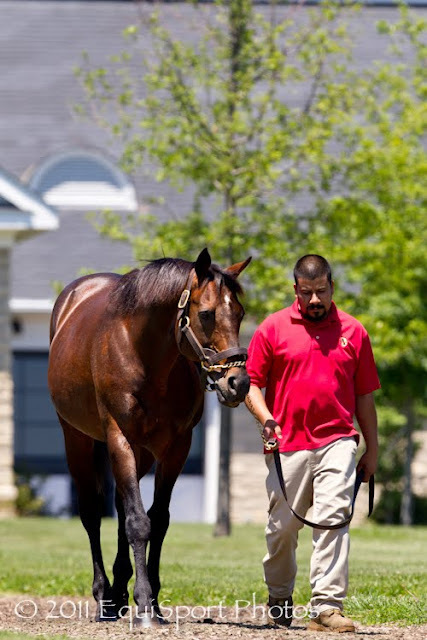 Turf & Dirt - On Horse Racing: Awesome Photo Shoot! 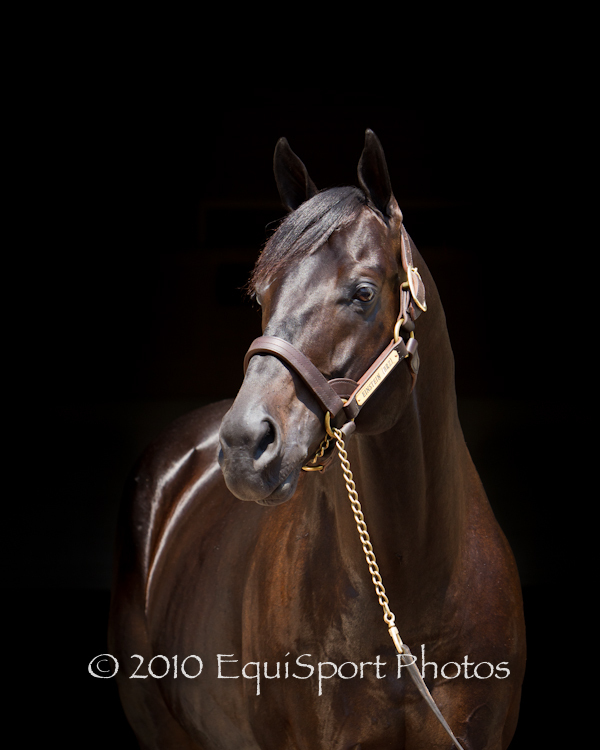 Adena Springs Farm, one of our favorite clients, called us in need of some fresh Stallion photos. It seems it was time to update "The Look". 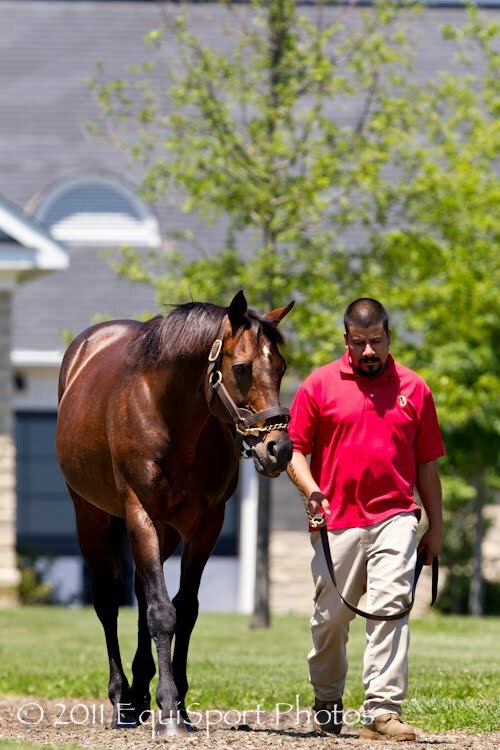 Not that the Stallions don't speak for themselves, Adena has been the leading Thoroughbred breeder worldwide for about the last decade. 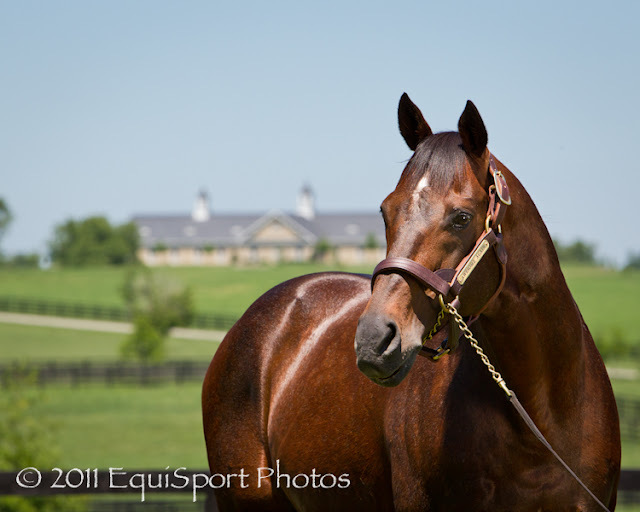 So, over the past couple of weeks, Wendy and I have made a half-dozen trips out to the Paris, Kentucky farm. Bill Drury, the stallion manager is always happy to see the photographers coming...lol. It only means that the boys need to get their baths, dried off, manes brushed, tails pulled, hooves dressed and halters cleaned. All pimped out for pictures. 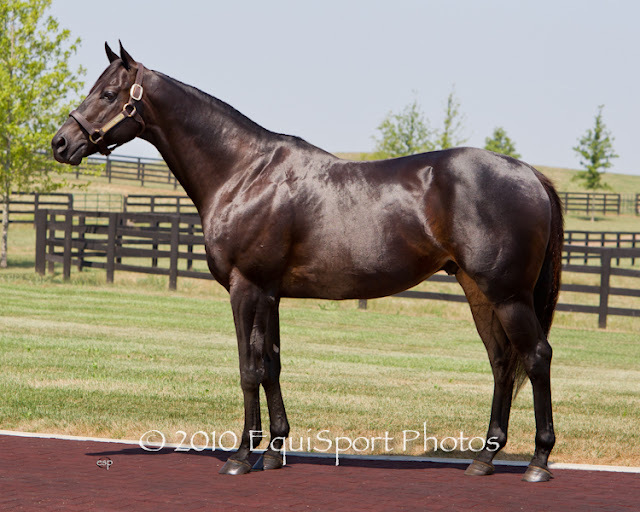 For 6 stallions. The crew really loves it when we show up. We were looking for something a little different than we had done before. I'm learning that just because I might be decent at a certain shot, doesn't mean it is for everyone. Each farm wants to have their own "look". After supplying a few different ideas, the farm chose the distant barn shot as an iconic Adena symbol. I'm working in Aperture Priority here at f/8. I don't care what the shutter speed is, as long as it's "fast enough". My goal, with f/8, is to have a good depth of field and good color. 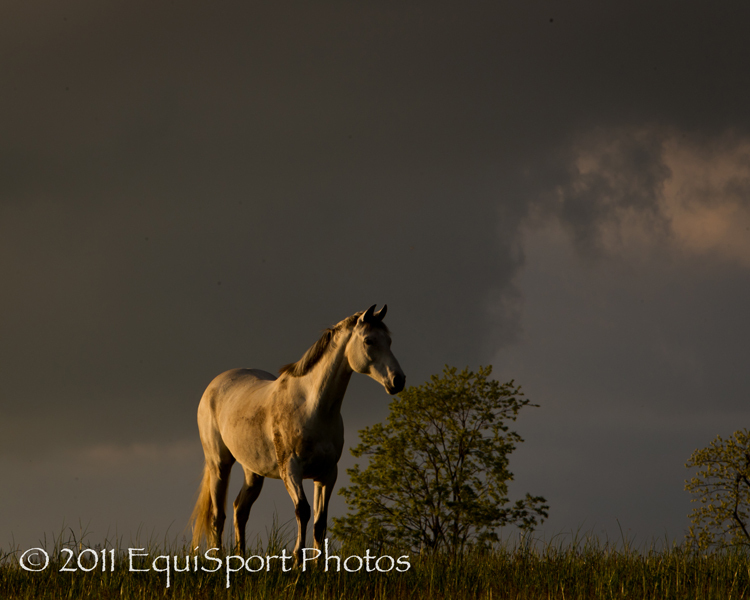 With my in-camera EV set at 0, I am actually underexposing the horse, but I have good color in the sky and background. 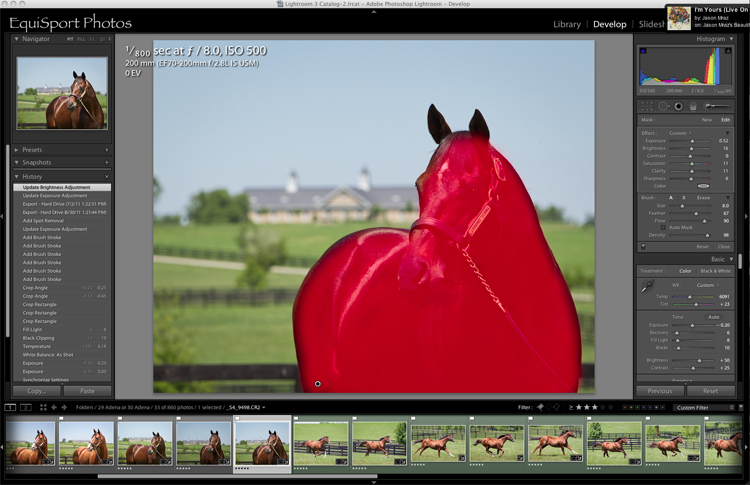 I know that I can selectively bring back the detail of the horse in Lightroom with the adjustment brush. I shoot EVERYTHING in RAW, by the way. I added about 1/2 stop of Exposure, and some Brightness to the horse in Lightroom. Wendy and I shoot a few different scenes for each horse to give our client some choices. Between us we take about 300 shots of each horse in hopes of putting 15-20 in a gallery for the client. This often takes multiple trips to the farm. Awesome Again being led out to the paddock. Photo: Matt Wooley, f/5 @ ISO 400, 1/1600th, -1/3 EV, 300mm. The paddock shots are our favorite. Wendy is shooting on a ladder from one corner with her 500 f/4 and I'm shooting from another angle with a 300 f/2.8. I'm still in Aperture Priority for this, to blur the background a little more... and I bump up the ISO so the Shutter Speed is "fast enough". We get a variety of head-on and side shots, both vertical and horizontal, while trying to eliminate any distracting backgrounds. Awesome Again paddock shot. Photo: Matt Wooley, f/5 @ ISO 400, 1/1600th, 0 EV, 300mm. One of my hardest lessons has been learning to NOT crop my images too tight (see above). The client needs room to add text in an ad, or they may want it cropped differently. They can judge the merits of the photo without me cropping it in tight. On a separate trip we photographed Einstein's new Conformation shot. After supplying the client several proofs, the shot below was selected. I removed the horse's shank and a background driveway from the finished picture in Photoshop. Einstein conformation. Photo: Matt Wooley, f/5 @ ISO 320, 1/1600th, 0 EV, 100mm. I shoot conformations in Aperture as well. F/4 to F/5 is a good depth of field to insure sharpness front to back on the horse, while blurring the background so the horse pops out. We also shot a portrait of Einstein. This is the "Old Style" that the farm is moving away from. Einstein portrait. Photo: Matt Wooley, f/5 @ ISO 320, 1/500th, -1 2/3 EV, 115mm. We placed the horse in front of the doorway to the breeding shed, just out in the sunshine. The Negative Exposure Value makes the already dark background go black. In both shots above Wendy is holding a gold reflector to throw a little light into key areas. We love to hear your comments! Or if you have a question, send it in and I will try to answer it.